A new human species has been revealed at the Cradle of Humankind on Gauteng’s West rand, called the Homo-Naledi. This is said to be the largest human fossil ensemble to be discovered on the African continent. 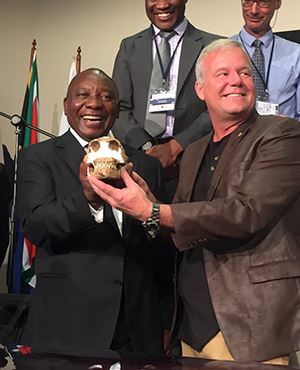 Deputy President Cyril Ramaphosa says the fossil species will change the way we see the future. Ramaphosa addressed delegates where the ground breaking discovery was being announced. So far, the team has recovered parts of at least 15 individuals of the same species, a small fraction of the fossils believed to remain in the chamber. – Additional text by Wits University and National Geographic.